Delhi, November 16, 2014: Let Harmony in Oneness not remain a dream but become a principle to be followed in life by one and all. Let us realize God as one and establish peaceful co-existence of the mankind as one single human family. This will certainly make us happy and prosperous. This was observed here late last evening by His Holiness Nirankari Baba Hardev Singh Ji Maharaj while addressing the first open session of the 67th Annual Nirankari Sant Samagam. 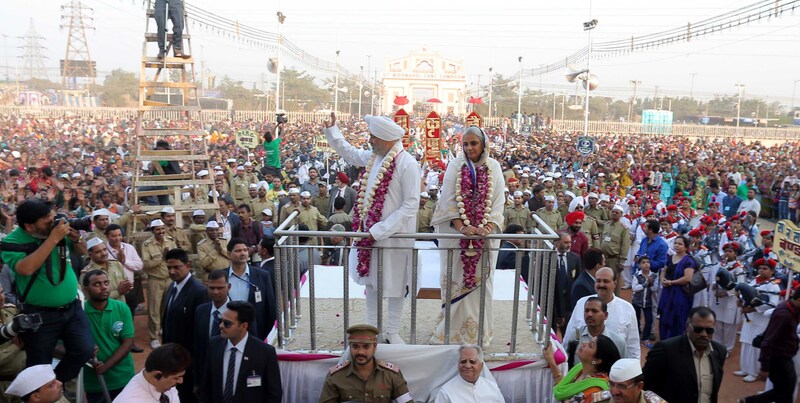 The 3-day Samagam is being attended by lakhs of devotees of the Sant Nirankari Mission and other God-loving people from all over India and across the world. His Holiness said that Harmony in Oneness has been adopted as theme of the Samagam because the Mission would like not only to adopt in our own life but also call upon every human being to follow it. Baba Ji said that if we want to strengthen the spirit of love, compassion, tolerance, large-heartedness and humility, we must strengthen oneness of the mankind. And this can be accomplished only by realizing God as one supreme entity. Baba Ji said that all saints, Gurus and prophets since ages have preached oneness of man through oneness of God. They cherished mankind to live with the spirit of love and unity. While Lord Jesus Christ ordained ‘love thy neighbor’, Kabir Ji talked about love in hindi – Prem, as a small word made of two and a half letters which can make man wise and worthy reverence. His Holiness said that the Samagam presents a beautiful example of unity in diversity. People coming from different regions, speaking different languages, wearing different styles of dress all are sitting here in harmony and creating a beautiful atmosphere. Like in nature, diversities here are treated as a sign of beauty whereas the world finds them as a reason to create walls of hatred, a cause for discrimination and violence. Baba Hardev Singh Ji Maharaj referred to the Gandhi Award presented to him in the Samagam by Gandhi Global Family on the eve of the International Tolerance Day and said that it was a sign of acknowledgement of the Mission’s contribution towards love and tolerance in the world. Similarly he said, a team of international doctors is serving here with charity just because they appreciate the Mission’s own endeavourer towards human welfare. Baba Ji also referred to his holy mother Nirankari Rajmata Kulwant Kaur Ji and said that she had participated in all the previous 66 Samagams and blessed us from the dais for more than 50 years. It is for the first time that we don’t find her present during the Samagam in her physical form. Her love and devotion and her spirit of service will, however, always guide us and motivate us to imbibe human values in our daily life. On Sunday, the Samagam began with a massive colourful Sewadal Rally. Thousands of men and women in their respective uniform, from India and abroad, participated. The Rally was marked by P.T.Parade, physical formations and games highlighting selfless service to humanity as ordained by Satguru. Some of the items related to Harmony in Oneness, the principal theme of the Samagam. Sewadal volunteers also remembered Nirankari Rajmata Kulwant Kaur Ji who motivated women to join Sewadal and render selfless service towards the Mission as well as humanity. The Sewadal volunteers rededicated themselves through selfless service and sought strength and ability from Satguru so that they can render their services in future also. Blessing the Rally, His Holiness said that along with Satsang and Sumiran, Sewa is also an important aspect of devotion to God. Sewadal volunteers are always ready to serve others even while fulfilling their responsibilities towards family and society. They see the same spark of divine flame in every human being and serve them without any discrimination. For example during recent floods in Jammu and Kashmir they provided relief to the people in areas known for terrorism. Baba Ji said that besides serving fellow devotees in local Satsang programmes and big Samagams Sewadal volunteers here are always ready to participate in social welfare activities like blood donation, eye check-up camps etc. and rescue and rehabilitation measures during natural calamities. They work with such a spirit of dedication, discipline and coordination that even outsiders would like to depend on them for distributing their own material through them. Earlier, Shri J.S.Khurana, Mukhya Sanchalak Sewadal said that whenever we get an opportunity to do Sewa, it means Satguru is pleased with us. Hence no Sewa is big or small, it’s a blessing from His Holiness. He prayed to Baba Ji to keep on giving an opportunity to Sewadal volunteers to serve others and also bless them with ability and strength to work selflessly.